The Thing Is . . .: Minakami Blooms! Minakami is in full bloom! The other day Pippi and I took a lengthy walk over hill and dale to inspect all the new growth up close. Voluptuous greenery is everywhere! And flowers, both wild and cultivated, dot the landscape with intense bursts of color. 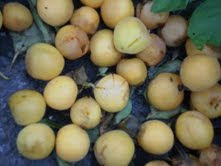 Wild plums clustered together at the side of the road. 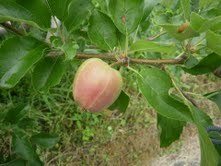 Though its apples won't be ripe for the picking until the end of August, Farmer Suzuki's orchard is already laden with fruit. Hopefully his blueberries will be ready next weekend -- the bushes are just barely bearing the weight of the berries. 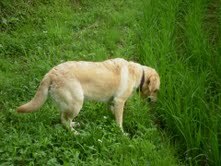 Yet nothing impressed us more than the rice paddies: terraced plots of land now lined with neat rows of green shoots. Measuring about 9 inches high, they still have a ways to go until their autumn harvest -- no rice kernels visible yet. 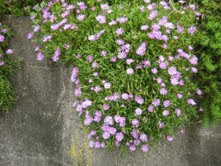 But they have certainly come a long way from the tiny plants tenderly placed in the mud last spring. Back breaking work that. No wonder all the local farmers seem to suffer from scoliosis or osteoporosis. It was hard to keep Pippi from nibbling the nascent plants. I suppose these water-logged grasses are just the thing on a steamy hot and humid day. Especially if you are wearing a fur coat. 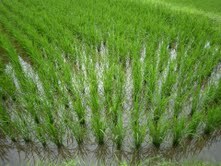 Recessed in the ground, the bottom of each paddy is currently covered with a layer of water, maybe 2 or 3 inches deep. I noticed that its surface was shimmering and assumed that winged insects were making continual water landings. But a studied look revealed a submarine world in miniature. The paddy was teaming with tadpoles! Little grey, wiggly ones at various stages of development. 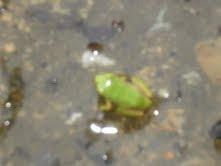 And where there are tadpoles, there are bound to be frogs. 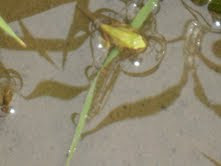 While the muddy water masked the swimmers, the bright green leaves were the perfect foil for the newly hatched jumpers. Active little critters, they do not like to sit still and pose for pictures hence the blurry images. But, as you can see, Mother Nature really gave them a running start by outfitting them with superb camouflage.